The TSA / TREELINE / MINT Shred Week! TSA / TREELINE / MINT Shred week is back, after a massively successful first year. 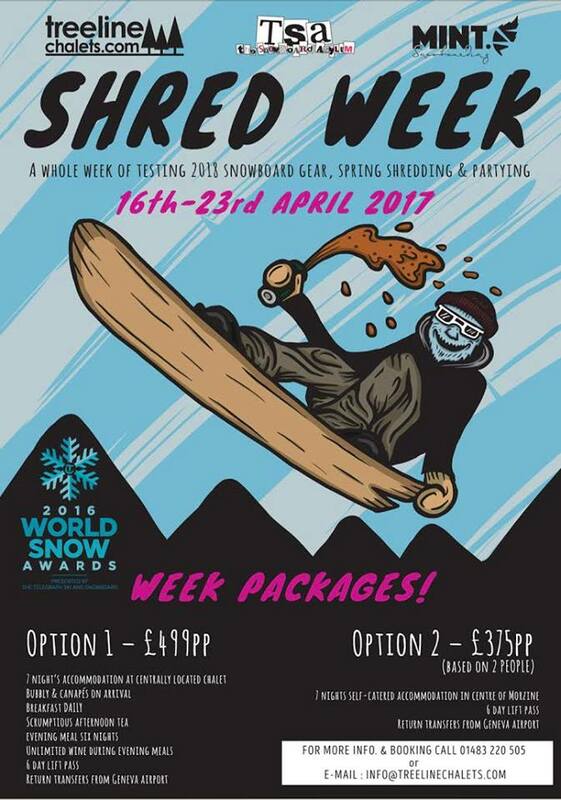 From 16th – 23rd April 2017, The Snowboard Asylum will be visiting us out in Morzine in full force for a whole week of spring snowboarding & equipment testing. And we want you to be there too! TSA will be bringing with them all the new 2017/18 snowboard hardware that you can test before anyone else. Some the elite team TSA riders are joining us, plus there’s an exciting schedule of coaching sessions from us at MINT Snowboarding. Accommodation is, of course, with the awesome Treeline Chalets offered in a fantastically affordable package. So theres’ no excuse not to get involved! PRICES START AT JUST £375pp INCLUDING ACCOMMODATION, SKI PASS & RETURN AIRPORT TRANSFERS FROM GENEVA!! !